I encountered a city of mythologies, a place of deep intellectual traditions where cultures and religions and languages clashed among the groups that lived together in the great mansion that was the Austro-Hungarian Empire. The First World War collapsed the mansion, destroying an empire and unleashing forces that caused scores to be settled and much blood to be spilled. 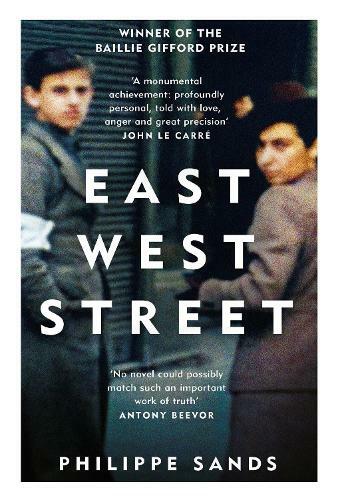 In what Daniel Finkelstein in The Times described as ‘a work of great brilliance… everything that happens is inevitable and yet comes as a surprise… in places I gasped, in places I wept,’ East West Street is both a history of atrocity and a relentless, brilliantly-pitched search for the truth. By seeking out the decimated past of his own family, Sands unearths the then-controversial origins of international human rights itself. An invitation to deliver a lecture in the western Ukrainian city of Lviv sets international human rights lawyer Philippe Sands on a profound quest that will both unearth the origins of international law and fill the terrible gaps in his own family’s decimated history. In the process, he both wrestles with the outcome of the laws created at the time and delineates the death machine built to destroy an entire people. Sands exhumes layer after layer of hidden detail, revealing the extraordinary story of two Nuremberg prosecutors who ultimately realise the man they are prosecuting may have been responsible for the murder of their entire families in Nazi-occupied Poland, in and around Lviv. These two remarkable men - Hersch Lauterpacht and Rafael Lemkin – sit at the heart of Sands’ exploration, whilst their quarry , Hitler’s personal lawyer Hans Frank, proves himself an equally compelling character. It is through Lauterpacht and Lemkin that the words 'crimes against humanity' and 'genocide' – at the time controversial notions – became part of both the judgement at Nuremberg and our lexicon of hate. The deeper Sands digs, he finally traces the grim events that overcame his own family during the Second World War. A Professor of law at University College London, Philippe Sands QC has written widely on the subject of international law as well as participating in major legal cases with global implications, including taking part in the 1992 Climate Change Convention and legal cases concerning the Belmarsh and Guantánamo detainees.